After a cardiac diagnosis or surgery it is strongly advised by your GP/cardiologist to attend a Cardiac Rehabilitation Programme. You'll get information about your heart condition and how your medication works as well as advice on making small lifestyle changes to keep you and your heart healthy. 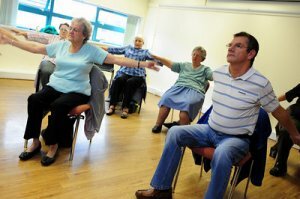 You can also get a supervised activity and exercise programme tailored to your individual needs taking into account other health problems you may have including arthritis, joint replacements and chronic breathing problems, which can be done seated or standing. Creswell Leisure Centre, Creswell - Tuesday 10am to 12 pm and Thursday 10am to 12pm. A six-week programme where you use a British Heart Foundation Cardiac Rehabilitation exercise DVD which has seated and standing levels of exercise to ensure all abilities are able to exercise. A cardiac exercise specialist will support you weekly by phone calls throughout the programme. Or alternatively ask your GP, practice nurse, matron or heart failure specialist nurse to refer you. Once accepted onto the programme, a member of the team will give you a clinic appointment to see the specialist cardiac rehabilitation nurse where you can discuss any issues you have and answer any queries.